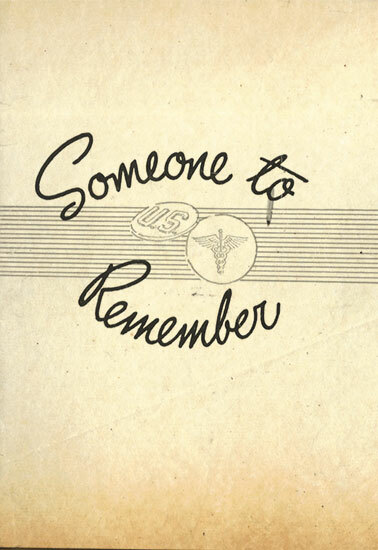 Illustration showing the front cover of “Someone to Remember”, a small pamphlet prepared by the staff of the 101st General Hospital, and printed in Germany in October 1945. Courtesy of Richard Rell. The 101st General Hospital was officially activated on 21 December 1943 according to General Orders No. 262 (Headquarters, 6th Service Command, ASF, Chicago, Illinois, dated 21 December 1943 –ed). Hospital Order No. 1 formally organized the unit on the same date at Camp Grant, Rockford, Illinois (Medical Replacement Unit Training Center; total acreage 3,349; troop capacity 453 Officers and 20,836 Enlisted Men –ed) with a cadre of 14 Officers and 99 Enlisted Men from the 253d Station Hospital (stationed at that time at Camp Adair, Corvallis, Oregon; Division Camp; total acreage 57,159; troop capacity 2,133 Officers and 37,081 Enlisted Men –ed). In the days and months that followed the unit’s activation, additional recruits arrived from all parts of the United States, and in January 1944, Lieutenant Colonel John Linfesty, MC, was appointed as the 101st’s first Commanding Officer. 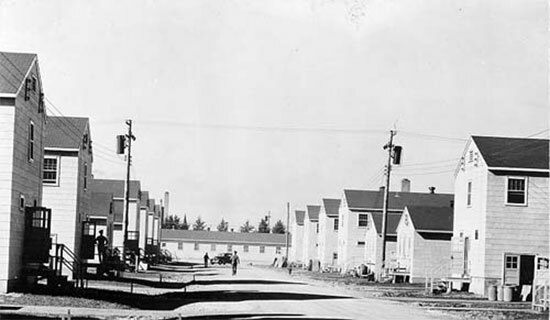 Exterior view of barrack buildings at Camp Grant, Illinois, where the 101st General Hospital was activated and formally organized in December 1943. Then followed months of training, schools, classes, lectures, orientation and general preparation of the personnel. Officers and Enlisted Men were added to the unit and the various sections and departments began to take shape and were slowly built up to T/O strength. June 1944 was a month of transition for the Hospital and its staff, for it brought many changes, alterations, additions, completions, extractions, transfers and renovations to the unit. 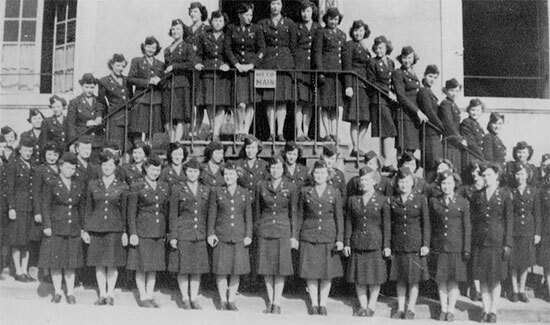 The balance of the cadre was finally completed by the arrival of Army Nurse Corps recruits, with further Officers and Enlisted Men transferred in to complete the required personnel strength. As per T/O & E 8-550 dated 3 July 1944 authorized personnel strength consisted of 55 Officers – 83 Nurses – 1 Warrant Officer – 450 Enlisted Men, while vehicles numbered 6 x 1/4-ton trucks + 4 x 1/4-ton trailers – 6 x 3/4-ton ambulances – 1 x 3/4-ton weapon carrier – 4 x 1 1/2-ton cargo trucks – 2 x 2 1/2-ton cargo trucks + 2 x 1-ton trailers – 1 x 2 1/2-ton dump truck w/winch – 2 x 1-ton 250-gallon water tank trailers. By 19 June 1944, all furloughs and leave passes had come to an end and final inspections of the unit were being carried out. Instructions had been received to prepare the outfit for a permanent change of station and in the days that followed, all organizational and personal equipment was packed. On 8 July 1944 the unit entrained and arrived the following day at Camp Myles Standish, Boston, Massachusetts (Staging Area for the Boston Port of Embarkation; total acreage 1,485; troop capacity 1,298 Officers and 23,100 Enlisted Men –ed). The Hospital’s personnel spent 10 days at the Staging Area, and temporary passes were issued to the nearby town of Taunton; last minute phone calls home were made, and further inspections were carried out. 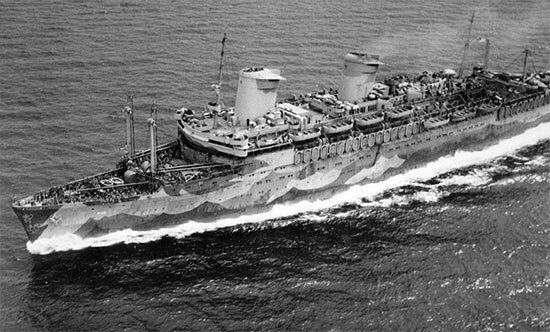 USS “West Point” shown in her wartime livery, the US Army Transport which carried the 101st from the Boston Port of Embarkation to Liverpool, England. On 18 July the 101st left Camp Myles Standish for the Boston Port of Embarkation, burdened with packs, duffle bags, steel helmet and other GI equipment. Upon arrival at the port, all staff boarded USS “West Point” (ocean liner built in 1940 for the United States Lines –ed). The ship left her berth the following morning, and all aboard were finally informed of their destination: the 101st would be heading to the United Kingdom. USS “West Point” arrived into the docks of Liverpool Harbor on 26 July 1944. After complete debarkation had taken place, the Hospital’s staff boarded trains at the nearby railroad station, and immediately departed for Taunton, Devon. Upon arrival at the outskirts of Taunton, the advance party rejoined the unit and convoyed together to Norton Manor Camp, a British Army training camp which was, at the time, being converted into a hospital site with the aid of the 365th Station Hospital. After setting up personal bivouacs and unloading all unit equipment, the 101st’s staff immediately began to assist with the necessary works of completing the facility. The constant rain sometimes hindered the development and slowed progress, but the works were nevertheless completed in a timely fashion. It officially opened to receive patients on 10 August 1944, receiving a total of four on its first day of operation. Within only two days, admissions were well over 400 and continued to rise as evacuated casualties from the fighting fronts arrived at a nearby airfield. 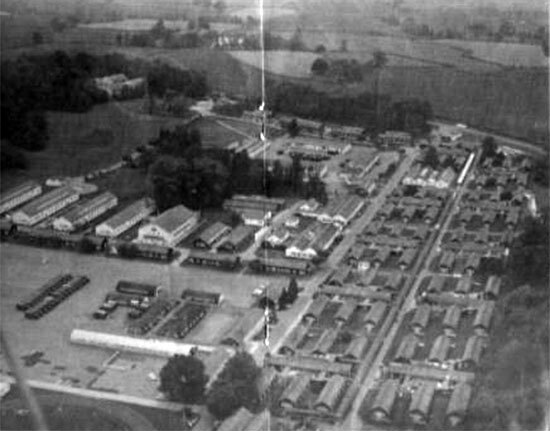 Partial aerial view showing Norton Manor Camp, the first home in the United Kingdom for the 101st General Hospital. It soon became apparent that the intense training undertook by the unit had been worthwhile. The 101st General Hospital functioned like a well-oiled machine, and by September 1944 any initial teething problems with the facility’s operation had been ironed out. The first batch of Enlisted Men’s promotions were released and a gymnasium was opened for both patients and personnel. Passes were also issued to nearby towns and cities: Bristol, Weston-Super-Mare, Bath, London, Bridgewater, etc. 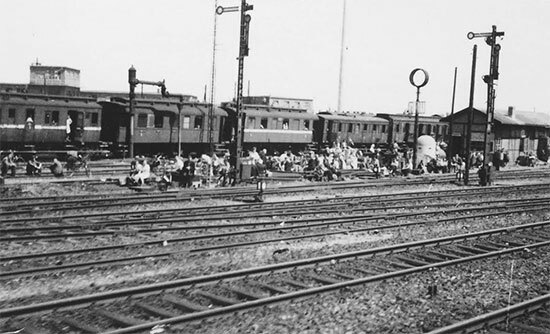 In the fall, patients were brought in by train instead of by air evacuation, and all personnel had to quickly turn their hands to unloading Hospital Trains. By the end of December, the patient census had soared to the highest mark of 1,726, and January 1945 was the busiest period of operation, with every working capacity of the unit being utilized. As the patient census decreased during the spring, there was more time available for passes, furloughs and leaves. Official orders were then received for the 101st General Hospital to close its doors at the Norton Manor Camp facility by 2 May 1945. In the days that followed, all patients were moved to other hospitals in the area, and the entire hospital complex was cleaned before being returned to the British Army. The 101st General closed Hospital Plant # 4107 for patients in Norton Manor, Somerset, on 28 April 1945. On 5 May 1945, the unit was once again alerted for movement, and the 23 May found it departing and entraining at Taunton at 0423 hours on a typical rainy, wet night. The train arrived at Southampton the following day, and the 101st prepared for its next operation; crossing the English Channel to France. The following day, the 101st General Hospital arrived into Le Havre and immediately debarked from its transport into LCIs (Landing Craft, Infantry -ed) for a trip down the Seine River to Duclair, France. A total of 3 LCIs were required to transport all of the Hospital’s personnel and equipment, and because of the crowded conditions, it was necessary to rotate the three groups on alternate deck shifts. Due to an error, the C Rations for the trip were all loaded on one boat, while the other two had only a small supply of K Rations. Needless to say, the members of the C Ration stocked boat disembarked with ample food supplies! 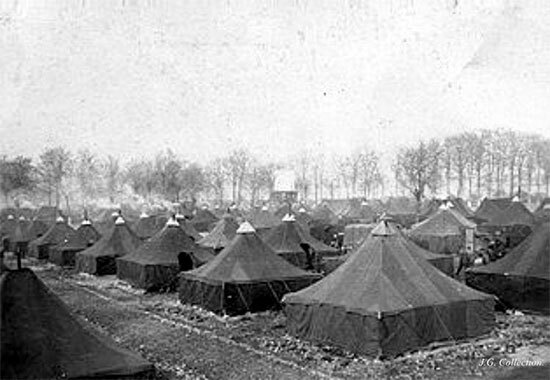 General view showing winterized pyramidal tents pitched at Camp Twenty Grand, one of several “Cigarette Camps” located in northern France. On arrival into the port at Duclair, all personnel left their respective LCI, together with their duffle bags and packs and made the short journey to Camp Twenty Grand (one of the many “Cigarette Camps” in the Le Havre vicinity, with a capacity of 20,000 –ed). The camp had not been completed long upon the unit’s arrival, and although cots arrived in the small hours, the majority of the staff spent their first night in France sleeping on the ground. The days that followed were relatively uneventful; chow lines, theater lines and meager food of poor quality. Soon however, the 101st’s mess hall was set up and the quality and quantity of food improved. With the aid of additional sanitary facilities and the arrival of post exchange rations and hot water, life in the camp became more pleasant – just as it was time to leave! On 6 June 1945, orders were received directing the 101st to leave Camp Twenty Grand, and the personnel immediately packed all personal items and marched towards Duclair, where they boarded “40 & 8s” (“40 hommes et 8 chevaux”, French boxcars for transporting 40 men or 8 horses –ed). After a 24-hour journey in crowded, dusty and uncomfortable conditions, the train finally arrived at Verdun, the Eagle Main Staging Area. After detraining, the troops moved towards the Maginot-Niel Medical Staging Area where it was billeted until 6 July. During the month of the unit’s stay, the personnel took tours, leaves, passes, practiced their French, looked over the countryside and the battlefields of the First and Second World Wars. Quite a few had the opportunity to visit Paris, Reims and other cities within train distance. Finally, orders arrived once again alerting the 101st for movement. The unit left the Medical Staging Area in trucks, and once again climbed into “40 and 8” railroad cars, which remained the unit’s home for the next four days and three nights. The first job everyone had was to make the cars as habitable as possible – this was largely achieved by strategically placing duffle bags, packs and other equipment. Members of the 101st General Hospital enjoy a brief moment of sunshine during the long train journey from Duclair, France to their new station in Germany. Courtesy of Richard Rell. As far as food was concerned, the trip could be aptly entitled “Oh you wonderful K-Ration” or words to that effect, although the train did run into a transit camp and all aboard had one hot meal en route. Each morning provided an interesting sight as members of the unit tumbled rather tiredly and sleepily out of the 40 and 8s to wash and stretch. Mirrors were propped up against any handy background and the troops tried to shave. One morning, the engineer decided to move the train without warning and left a trail of bewildered, frantic and lathered soldiers. They stood, staring unbelievingly at the rapidly departing train, as they held a razor or shaving brush in their hands. The inactivity changed to a speed in a hurry as they grabbed clothes, helmets full of water and other belongings and raced after the train, yelling frantically. From then on, shaving was done with everything handy, in case a hurried exit was in order. Finally, on 9 July 1945, the 101st arrived in Helmstedt, Germany. It was announced that the rail convoy could continue no further, and so all personnel detrained and were then driven to the tented Helmstedt Staging Area, where they took some much needed rest after the lengthy train trip. After an advance party had preceded it, the balance of the unit then travelled via motor convoy to Wannsee, Germany, arriving on 13 July 1945. This small Berlin suburb was the unit’s first sight of the battered and smashed capital, and all of the personnel took the opportunity to explore much of the city; the famous Tiergarten “Black Market”, Potsdamer Platz, Unter den Linden, Reich Chancellery, the gutted Reichstag, Berlin Tempelhof Airport and much more. Since the 101st had arrived into Germany several months after V-E Day, many of its personnel were sent on temporary or special duty to Dispensaries, to the site of the “Big Three” conference (Potsdam Conference between Soviet leader Joseph Stalin, British Prime Minister Winston Churchill (replaced on July 26 by Prime Minister Clement Attlee), and U.S. President Harry Truman; held in Potsdam from 17 July 1945 – 2 August 1945 –ed), or to the 113th Evacuation Hospital which was already established in the vicinity. This new status lasted only one week, for a new site, more adaptable for a General Hospital had been located and the 101st once again packed up and hiked to Neukölln, a locality on the opposite side of Berlin. It was with regret that the personnel left the homes, apartments and the luxury with which they were just beginning to believe was true, and started moving. 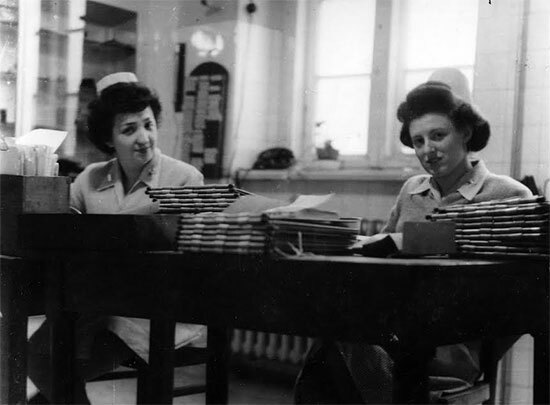 Second Lieutenant Olga A. Petza and another unidentified Nurse carry out various administrative tasks in their office at the Zinnewald Schule in Neukölln during the unit’s time in Germany, September 1945. Courtesy of Richard Rell. Because the Hospital continued to operate while moving, it took a week to transplant all of the personnel, equipment, patients, etc. and set same up in the new site. Then followed more work to open up, repair and build more departments and sections. The first trickle of staff members departing for the States began in early August, and more changes became effected in personnel. By the middle of September 1945, the 101st was the only General Hospital in operation in the Berlin District, American Zone, operating out of the Zinnowwald Schule (Zehlendorf), a former public school on the outskirts of Berlin. It was here that the organization opened its 450-bed medical facility, which would operate from 25 August 1945 to 17 September 1945. Orders applying to the 101st General Hospital were issued with Circular No. 82, dated 18 September 1945, U.S. Headquarters Berlin District and Headquarters First Airborne Army, Berlin, Germany, APO # 755. It was further indicated that the 101st was to open Hospital Plant # 4468, at 0001, 18 September 1945, in Krankenhaus Buckow (Buckow). During the above period, the hospitalization policy for Army Hospitals within the Berlin District was 10 days for the 279th Station Hospital and 120 days for the 101st General Hospital for conditions other than VD. Instructions from the Surgeon, Berlin District, stipulated that patients examined at Dispensaries and whose diagnosis indicated that they could be returned to duty within ten days were to be transferred to the 279th Sta Hosp (operating Hospital Plant # 4464, at the Stubenrauch Krankenhaus) for necessary medical care. Those cases examined at Dispensaries and whose diagnoses indicated that they would require over ten days hospitalization were to be transferred to the 101st Gen Hosp for further medical care. Nurses of the 101st General Hospital pose for the camera. This photograph is believed to have been taken in Germany during the unit’s last days of operation. Courtesy of Richard Rell. 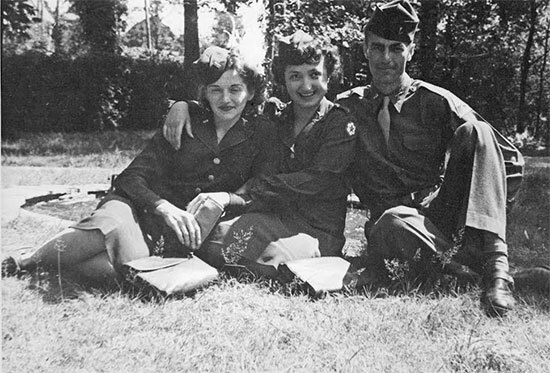 Second Lieutenant Olga A. Petza and another unidentified Nurse and Officer of the 101st General Hospital relax in their Class A uniforms somewhere in Europe. Courtesy of Richard Rell. 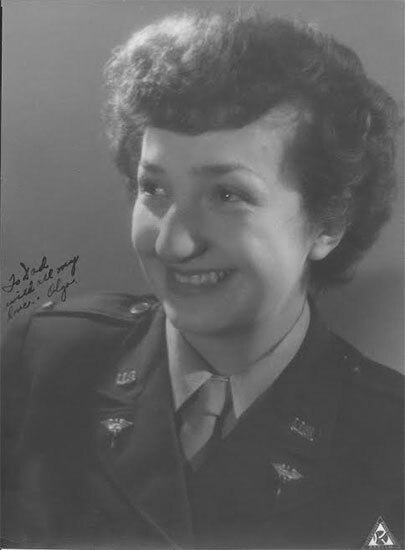 Studio portrait of Second Lieutenant Olga A. Petza who served with the 101st General Hospital from activation in December 1943 until the end of the war. Courtesy of Richard Rell. The MRC staff would like to thank Richard Rell, son-in-law of Second Lieutenant Olga A. Petza who served with the 101st General Hospital during WW2. Richard was able to share a small booklet entitled “Someone to Remember” which was published in Berlin, Germany on 1 October 1945 detailing the unit’s service overseas. We are still looking for further information regarding the 101st General Hospital’s return to the Zone of Interior and its eventual inactivation – any further assistance would be gratefully received.